Jan de Vries (1890-1964) was the most famous scholar on Germanic history in the Netherlands, but also in Germany, since many of his books are only available in German. During WWII De Vries chose the wrong side spoiling his carreer. His most famous work and classic in the ‘genre’ Altgermanische Religionsgeschichte has never been translated and has been out of print for decades. 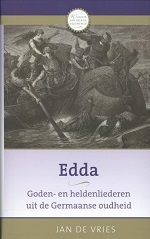 However the publisher AnkhHermes tries to avoid every connection with ‘faulty’ people, they do, fortunately, keep printing the oldest translation of the Poetic Edda in Dutch. That they struggle with this publication will be obvious in what follows. De Vries first published his translation in 1938. There have been two reprints in 1942 and in 1944 and 1952. The 1952 printing is not too hard to find. It came in two volumes, one with ‘songs of the Gods’ and one with ‘songs of heroes’. Wikipedia information could be explained that every reprint is also a revision, but my 1952 print says nothing of that. In any case, these old printings were all published while De Vries was still alive, so I guess/hope that he has been involved in these reprints, so the 1952 translation is still really his. In 1978 the big ‘new age’ publisher Ankh-Hermes decided to take the translation into their series of the classics of the world. This translation is wonderfully produced in an uncommonly sized book and with photos on shiny paper. There have been several reprints. I never really gave it a thought, but for this sixth reprint (the first of Ankh-Hermes), the text was revised by a Dutch professor and a daughter of De Vries. Now for the twelfth reprint the translation is revised once more, this time by an anonymous editorial staff. Both revisions are supposedly to make the language more modern. I wonder why! De Vries made his translation to keep the rhythm and alliteration in tact as much as possible. This results in shortened words and order in sentences that are strange in Dutch, but does that not often go for poetry? Besides, many of these word orders and strange terms have been left unaltered. Wondering what the revisions are, so compared my 1952, 1999 and 2013 editions. There are 50 changes between the text in the 1952 printing and the 1999 and 13 more in the 2013 translation of the Voluspa alone. These changes differ from the removal of shortening of words and adding or removing capitals or punctuation, to more serious editings such as the order of words in a sentence or even new translations of words. Of course there are a lot of ‘modernisations’. Some editings look like the improvement of spelling error, such as “soot red” which is replaced by “blood red” in verse 36, but then again, De Vries probably coordinated 5 printings of his translation, so what if he actually meant to say “soot red”? A certainly more serious editing (twice!) makes verse 25 in which is mentioned what killed Baldr. De Vries had it as “tak der mistel” (we do not adjust prefixes to the gender of a word anymore (like the Germans do still), so this looks ‘oldfashioned’), which was changed to 1994 “een misteltak” and “een maretak” in 2013. Now this is a translation based on the interpretation that this “mistel” is a mistletoe, but I have my doubts that the Dutch word “mistel” is just a synonym for “maretak”, especially because the verse says that this branch grows in the field! I am sure that De Vries thought long and hard about his translation, so why just leave it as it is? There are more of such arbitrary changes. In verse 13 the Norns are originally said to “spelden de toekomst”. Now this is weird Dutch, but I would interpret it as if the Norns ‘make’ the future, but this is changed to “voorspelden de toekomst” or ‘predict’, which is -of course- something wholly different. Another thing is that the publishers also revised the preface of the author and replace “non neutral” words such as “heidens” (“heathen”) with things like “non Christian”. Argh! I am sure that De Vries used the word “heathen” to refer to the Northern European pre-Christian religion, but “non Christian” is of course a whole different thing. Also annoying is the fact that words such as Valkyrie, Vanir, Aesir, Norns, Alves, etc. have been put in Italics and start without a capital, even in combined words such as “azengeslacht” (‘lineage of the Aesir’) and that “Yggdrasil” is changed to “Ygdrasil” and “Baldr” to “Balder” (to just name a few examples). In any case, this review is not of much interest if you cannot read Dutch, but it is likely that the same problems go for other translations as well. Also, or particularly, with ‘updated’ reprints. The good thing is that I am now reading the texts with more attention. I might even check my other Dutch translation, my English translations and get my Icelandic print from the shelf. Who knows, I might find out better for myself what I think the texts say. So, if you are Dutch, there is a nice-looking new translation of De Vries waiting for you. If you are not Dutch, have a critical look of the different translations that you have.